The word “confidence” rang out many times—from the covered arena where Debbie McDonald coached developing rider Genay Vaughn on Donarweiss GGF and 15 minutes later the same word came across the speaker in the outdoor arena as Robert Dover reminded elite rider Dawn White O’Connor on Aristo that the greats have confidence because of the success of the work at home. The Oct. 11-12 West Coast version of the Pipeline Clinic showcased some fancy participants—the USEF Developing Horse Prix St. Georges Champion Sanceo, ridden by Sabine Shut-Kery; Markel/USEF 4-Year-Old Champion Rosalut NHF ridden by Carly Taylor-Smith; and Markel/USEF 5-Year-Old Champion Emilon SA, ridden by Kelly Casey. All 17 horse and rider combinations in the Pipeline Clinic carried a healthy list of accomplishments at many levels which brought them to the attention of Pipeline coaches Robert Dover, USEF Chef d’Equipe/Technical Advisor, Debbie McDonald, USEF Developing Coach, and Scott Hassler, USEF Young Horse Coach, for the invitational clinic at Epona Farms in Thousand Oaks, Calif.
All three coaches rotated through two arenas for 45-minute sessions, before 70 auditors, bringing an air of excitement about the riders and their prospects. Each coach has his own style and emphasis and yet there is a clear compatibility in their teaching philosophies and focus. Sabine Schut-Kerry participated in the Pipeline Clinic aboard her young superstar Sanceo. The horses and riders move through one or more of the four categories—Youth, Young Horse, Developing Horse and Elite—working under the direction of one or more of the four national coaches. The concept of the pipeline for horses and riders is more firmly part of the equestrian culture in Europe, but is making progress in the United States. “Let’s say I have about 200 horses in my radar. There are probably 2,000 I don’t know about. I’ve been doing this for 10 years and now I’m hearing from dressage or breed judges that they’ve seen a great horse that I should know about a horse,” Hassler continued. Spokane resident Kasey Perry had been scouted when she competed in Florida last season. Dover clearly recalled Perry and Diane Perry’s mare Trøstruplund’s Scarlet from their competitions. After watching her warm up Scarlet, he asked her goals. When she spoke of the FEI World Cup Final, they agreed that her 72 percent for her highest freestyle score might be greater with an improved technical side of the test. Perry explained, and Dover had witnessed, that the mare is quite hot at shows, but relaxed and calm at home to the point where Perry feels she needs to work to keep her impulsive. At shows, she tends to back away from aiding the mare because of her exuberance. That consistency included teaching the mare to always work responsively off Perry’s seat. “Have her hot so you can sit in correct position and stay like that. Do piaffe and passage without leg [aids],” Dover advised. Collect that which wants to be extension all the time and then manipulate the balance. That excitement was replicated in the other Epona arena where McDonald entreated developing rider Ari Lopez, riding Coralander II, to not settle. “It’s no longer about just getting the job done or what you can get away with,” McDonald said. The Pipeline Clinic had much to say about the complexity of an equestrian athlete’s life, not just about riding. The strategy of the clinics and their accompanying coaching segments is to develop the athletes scouted to participate in the program not just as riders, but as all-around professionals. In addition to riding for two days with a coach from their category, riders attended sessions on score analysis, nutrition, fitness, sports psychology, and media/sponsor/owner relations. Riders were introduced to the benefits of a digital analysis of their tests, movement score by movement score, through www.globalanalytics.com. The program shows which movements are pulling down the overall score and tracks trends in tests over time. Fitness sessions conducted by strength and conditioning physiology specialist Amanda Wittenmyer of the U.S. Olympic Committee found the group divided between riders whose only work-out is the several horses they ride every day and those who work out in addition to riding. After a breakthrough clinic ride on Cadence LLC’s mare 11-year-old Grand Prix Westphalian mare Liaison, Beth Ball joked about “channeling her inner Dover,” referring the inspiration derived from riding with the clinician. The sports psychologist described how she works with competitive marksmen. She has the shooter aim and then, having them focus only on the gun sight, not on the target, for better accuracy. Media, owner and sponsor relations was the topic for the Saturday evening dinner with a panel discussion moderated by Mason Phelps of Phelps Media Group. Among the panelists was USET Foundation Trustee Betsy Juliano of Havensafe Farm whose gift has made these clinics possible. 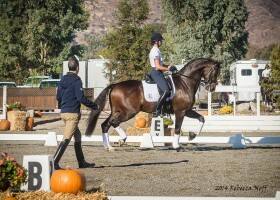 Juliano, a dressage competitor, explained why she chose to help these clinics come to fruition. “When I started to have horses compete, I would see the riders go through the process of getting to Gladstone, and then the [World Equestrian Games], and I realized the importance of synergy among team members. And as we are an innovative and strategic culture, we needed a strategy to ensure that everyone knows each other in a non-competitive arena where they are supportive of each other,” she said. Dover summarized his vision for the program. “We are creating the system in which excellence can thrive. Americans like be the winner of things. When we see something inhibiting our ability to be at the forefront, we do what’s necessary to be in front,” he said.